Harriet developed Mindfulness programs for the Central Bucks Gymnastics Team (Bucks County, PA). Athletes ranged in age from 6-18 years old; coaches and athlete parents also participated! 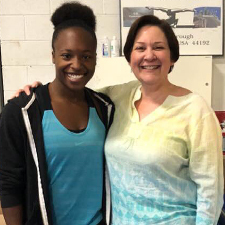 Harriet is shown here with former elite/Stanford University gymnast Elizabeth Price (August 2018). If you’d like to see a Perfect 10 floor exercise, click on the learn more button.